We’re moving things around this week by putting Find Of The Day up at the start of the week. Today’s car is begging for long summer drives. If you’re in the market for a new ride, this 1992 Jetta GLI VR6 should find its way into your garage. You read that right: there’s a VR6 engine stuffed under the hood of this MK2 Jetta. The 2.8L engine is from a ’93 Passat and it’s mated to a 5-speed transmission. You’ll drive everywhere with the (crank!) windows rolled down to hear the engine growl as you unleash all 172 horsepower. The two additional cylinders bring substantial horsepower increases: 72 more than the 1.8L “standard” engine and 38 more than the 16V GLI. The engine isn’t the only exciting thing in this Jetta. To start, there’s the Rallye headlights and grille. Early “small bumpers” replace the original “big bumpers.” Out back there’s a wide rear wing on the trunk lid, Euro plate tub, smoked cherry taillights, and a Jetta GLX badge. It even has upgraded pull-style door handles. The car sits on Raceland coilovers and rides on 15″ 1552 “Snowflake” alloys with now-discontinued Yokohama S-drive tires. All four corners now sport 5×100 wheel hubs. And the inside is as clean as the outside. The power Recaro seats are in phenomenal shape. The are no cracks in the dash with the rare tilt-steering wheel. A new tweed headliner lines the roof. Check out the center gauge pod and pop-out cupholders. There are upgraded speakers all around and a pair of subs in the trunk. But who needs all that when there’s a glorious VR6 under the hood? Interested in this wookie-powered wonder? Check out the ad in our classifieds. Or check it out in person in central New Jersey. 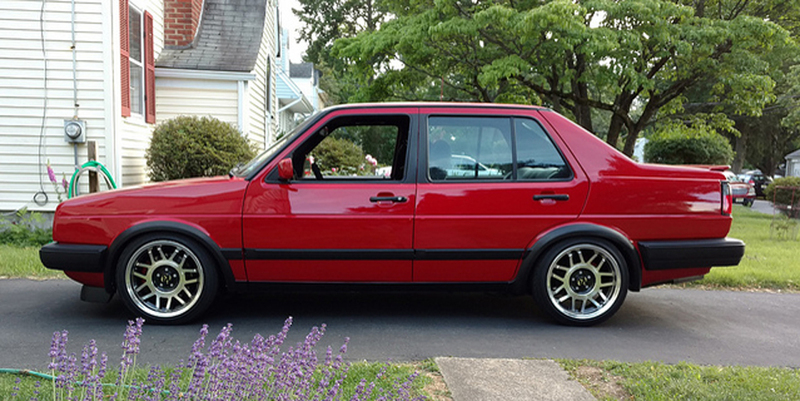 The seller, VWVortex member BAK2BA6, is asking $9250 as-is, or $8250 without the wheels.